ab9697 is a globular protein containing 53 amino acid residues, including 3 intramolecular disulfide bonds. Our Abpromise guarantee covers the use of ab9697 in the following tested applications. The ED50 was determined by a cell proliferation assay using balb/c 3T3 cells is ≤ 0.1 ng/ml, corresponding to a specific activity of ≥ 1 x 107 units/mg. Manufactured using all non-animal reagents. Centrifuge the vial prior to opening. Reconstitute in 500ul sterile filtered water to a concentration of 1mg/ml. Contains 9 LDL-receptor class B repeats. O-glycosylated with core 1-like and core 2-like glycans. It is uncertain if Ser-954 or Thr-955 is O-glycosylated. The modification here shows glycan heterogeneity: HexHexNAc (major) and Hex2HexNAc2 (minor). Immunocytochemistry/ Immunofluorescence analysis of A431 (Human epidermoid carcinoma cell line) cells labeling EGFR with ab9697 at 1/100, 3 μg/ml. Cells were fixed with 4% paraformaldehyde and permeabilized with 0.1% tritonX-100. ab150077, a AlexaFluor®488 Goat anti-Rabbit IgG was used as the secondary antibody at 1/1000, 2 μg/ml. Cells were counterstained with ab195889, anti-alpha Tubulin antibody [DM1A] - Microtubule Marker (Alexa Fluor® 594) at 1/200, 2.5 μg/ml. Nuclear stain was DAPI (blue). The green staining on the membrane was increased in the EGF (100ng/ml, 10min) treated A431 cells when compared with A431 cells without treatment. After LP treatment, the green signaling was obviously decreased. For the pan antibody, there was no great difference after EGF (100ng/ml, 10min) or EGF (100ng/ml, 10min) + LP treatment. The data showed mostly membranous staining. Review text: Human skin fibroblasts (HFF-1) were starved in serum-free medium overnight, and then were incubated 30 min in the presence of either 25 or 50 ng/ml active EGF protein, doses widely used in stem cell culture medium, to test whether EGFR downstream signaling pathway is able to be activated. 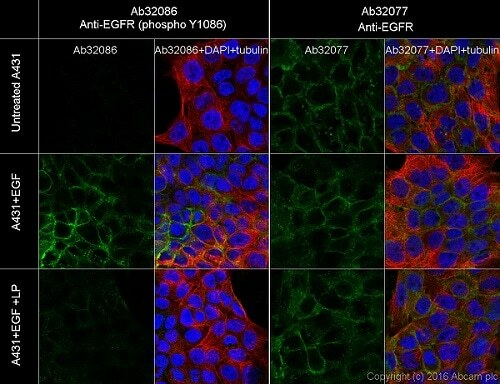 Additional Notes: Incubation of human fibroblasts with active EGF protein for short time greatly activated EGFR signaling pathway, as the receptor underwent endocytosis and dramatic phosphorylation of p44/42 MAPK.